Combat is characterized by rapidly unfolding events taking place unexpectedly and often during periods of low visibility. If you are the intended victim, you will not have the element of surprise nor the initiative in the opening moments of the conflict – two elements critical to the survival of such an event. The suddenness of the event will degrade any shooters accuracy and the hit probability of a single projectile weapon will be correspondingly low. Shotguns are well known for their ability to increase hit probability and to deliver what is commonly believed to be ‘devastating’ terminal effectiveness at close range. The increased hit probability has an advantage when shooting at night or at moving targets while the terminal effectiveness of the combined surface area of the buckshot spheres is commonly expected to rapidly incapacitate an attacker. Shotshells contain lead spheres of different diameter and these different diameters are optimal for different usages. Larger spheres travel further and penetrate further into soft tissue than smaller spheres at any given velocity. Shotguns increase hit probability by launching multiple projectiles per trigger pull but the limitation is that shotshells can only hold so many spheres or pellets. Logically, less pellets equals a lower hit probability against distant targets. ⇔ Having a hit probability greater than chance (greater than 50% of pellets make scoreable hits on target). ⇔ Buckshot traveling fast enough to make incapacitating hit at this range (12.0” or deeper penetration in nominal 10% ballistic gelatin). ⇔ Target is facing shooter. ⇔ Shooting done during Standard Atmospheric conditions. A small increase in effective range will occur in hot climates and a moderate decrease in range will occur in extreme cold climates. ⇔ Cylinder bore shotgun in use. Tighter chokes will allow for greater hit probability at distance but will likely increase drag by deforming the pellets - reducing penetration of target. 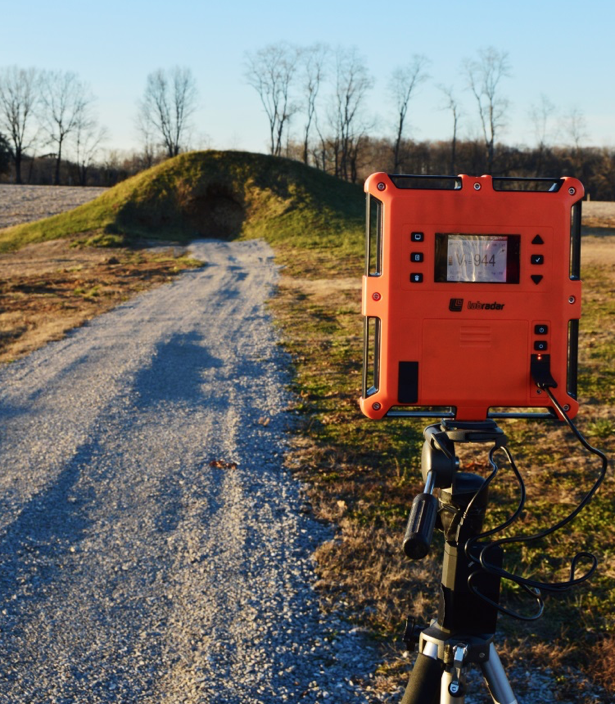 Two phases of terminal ballistics testing were conducted: shooting of factory shotshells into gelatin at 10 feet distance and shooting single buckshot pellets into gelatin at 10 feet. The single buckshot pellets were acquired from shotshells shot from a SAAMI 12 gauge test barrel (24” length, cylinder bore) into a cotton soft-catch box (Figure 1) and were then handloaded and shot into gelatin from low-pressure handgun cartridges (Figures 2, 3, and 4) at a wide range of velocities. The factory shotshells provide a baseline with which to compare the results achieved with the single buckshot pellets shot into gelatin as a verification of the acceptability of simulating long-range hits with single buckshot pellets shot at reduced velocity. For the purposes of this report, the definition of buckshot is broken out into two categories: deformed and spherical. Buckshot pellets must be copper-plated or made of high antimony lead and feature an effective wadding system in order to be considered to fall into the performance category of spherical buckshot. Readily-found shotgun shells tend to fall into the performance category of deformed buckshot due to a lack of plating or an effective wadding system. Only a ‘soft’ recovery (shooting gelatin, water or cotton) will tell you which type of buckshot your shotshell produces. "Prior to the utilization of any block of gelatin, validation of the block will be tested to assure consistency of the gelatin mixture. This test consists of firing a .177 caliber steel sphere (BB) into the gelatin block at 590 feet per second (fps) +/- 15 fps. This sphere must penetrate a minimum of 2.95 inches (75mm) but no more than 3.74 inches (95mm)". All objects lose velocity as they travel through the air. 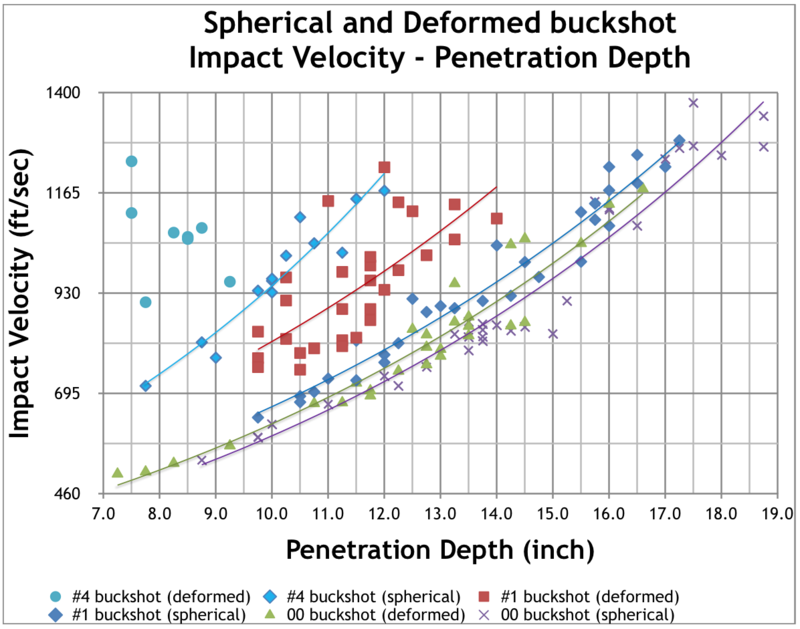 It was necessary to determine the velocity of the buckshot spheres as they traveled downrange to know the maximum range at which the pellet would be able to meet the 12.0” minimum penetration depth in ballistic gelatin. 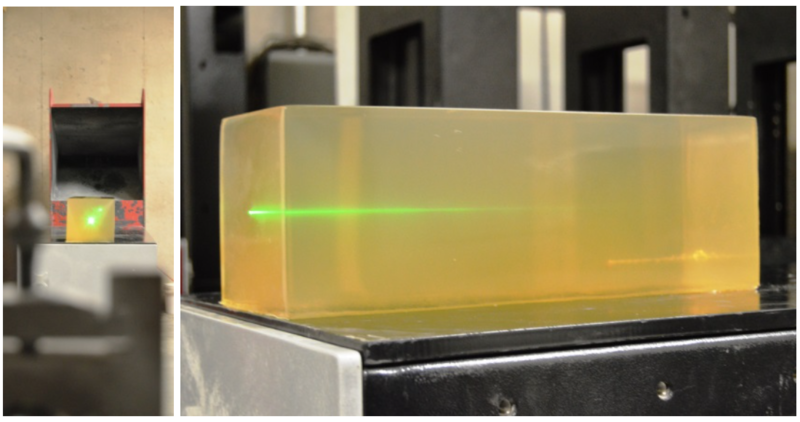 This minimum velocity was found in Phase I, the terminal ballistics portion of the testing. We see that the deformed #1 buckshot sphere will have slowed down to 993 ft/sec at a distance of 29 yards from the muzzle which corresponds to the penetration depth in gelatin of 12.0”. The impact velocity versus penetration depth in ballistic gelatin for all evaluated buckshot types are below in Figure 10. To determine the effects of aerodynamic drag on the velocity of a buckshot pellet as it moves downrange, the velocity of the single-launched buckshot pellets was measured by LabRadar Doppler radar (Figure 11). 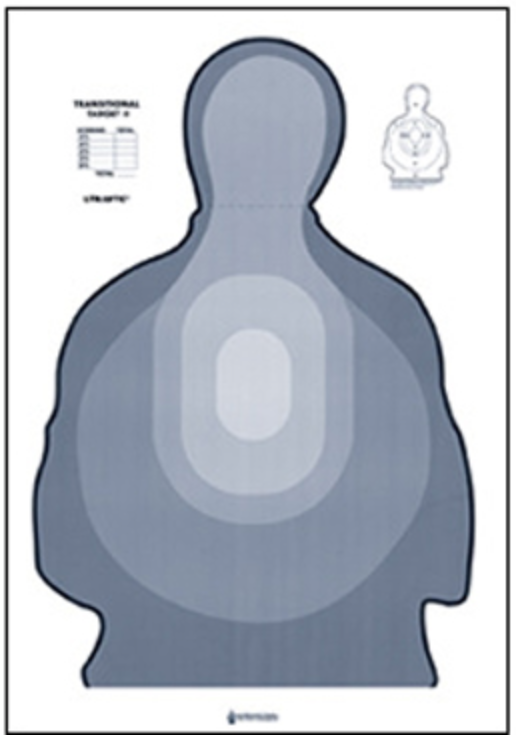 Hit probability was determined by shooting a Mossberg 590 from a shooting bench at various distances from a FLETC Transitional Target II with the (5) different cartridge types. Deformed #4 buckshot was excluded from the testing due to its inability to meet the gelatin penetration criteria at muzzle velocity. The tested Mossberg 590 had a cylinder bore which was boresighted with a Site Lite SL-500 Ultra Mag Green Laser Boresighter to coincide with a SIG ROMEO4 red dot sight at 25 yards distance. This gave the reasonable expectation that all shots taken during the dispersion testing were aimed at the center-of-mass of the FLETC Transitional Target II. Each shotshell type was shot (10) times at (10) individual targets. A hit in this instance is a hit to the target that would be counted for qualification at FLETC. Shot impacts to the thick blue border were not counted. Hit probabilities measured for each shotshell can be found in Table 1 below. 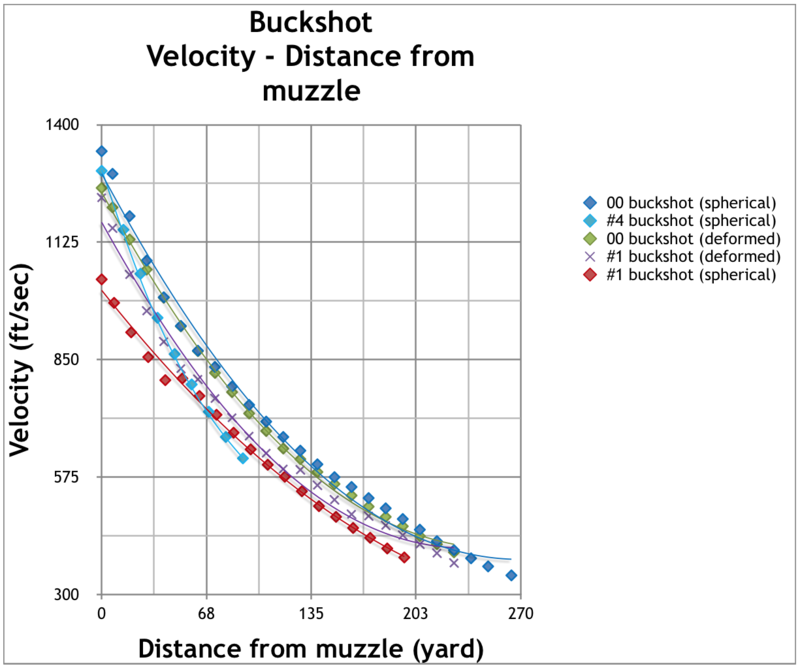 Distances between muzzle and target for the #4 buckshot and unplated #1 buckshot correspond to the maximum distance at which a single shot pellet is expected to be traveling fast enough to score an incapacitating hit. The remaining shotshells were shot at 40 yards distance. It will be noted from above that the physical distance between the muzzle of the test shotgun and the paper targets was 40 yards for the #1 buckshot (plated, pattern-controlled), 00 buckshot (unplated, buffered) and 00 buckshot (plated, pattern-controlled.) This was to ensure that all shot pellets struck the paper and could be accounted for in the further range calculation. The 00 buckshot (unplated, buffered) load impacted the targets with greater than 50% of the shot pellets at least 50% of the time. 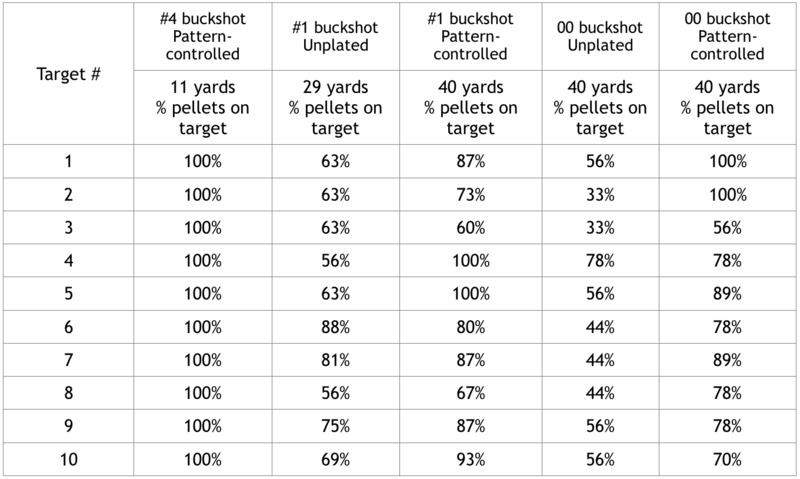 The #1 buckshot (plated, pattern-controlled) load had a higher hit probability than the unplated 00 buckshot (maintaining a hit probability of 50+% out to 57 yards) but the individual pellets lacked the mass and initial velocity to retain terminal effectiveness beyond 51 yards. As such, the maximum effective range of this load was determined to be 51 yards. 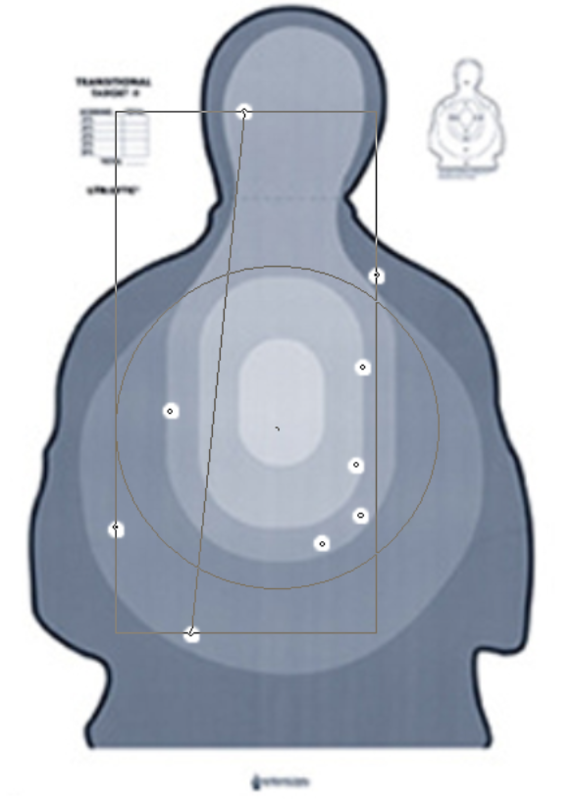 The 00 buckshot (plated, pattern-controlled) load maintains a hit probability of 50+% out to 52 yards, which is the limiting factor in maximum effective range because the individual pellets are sufficiently massive and have a high enough velocity to retain terminal effectiveness to a distance of 104 yards. Determination of hit probability (past the 40 yard distance that was physically tested at) was based upon the average mean radius of the tested 10 shotshell/10 target test groups. Mean radius is defined as the average of the straight line distances between the Center-of-Shot-Group and each shot (USARIEM TECHNICAL NOTE TN-01/2 STATISTICAL MEASURES OF MARKSMANSHIP Richard F. Johnson Military Performance Division February 2001 U.S. Army Research Institute of Environmental Medicine) and was determined by utilizing OnTarget TDS software (OnTarget TDS). Because of aerodynamic drag, buckshot spreads radially outward at a rate that is nonlinear with the translational travel of the pellets towards the target. For example: the 00 buckshot (plated, pattern-controlled) load, on average, spread 6.2 inches from the centerline of the bore by the time the shot pellets had traveled the 40 yards distance. The driving determinant of drag force is the velocity that an object travels at – in this case the 00 buckshot was initially traveling radially outward at 5 ft/sec while the muzzle velocity of this shell was 1300 ft/sec. The fluid drag at 5 ft/sec is negligible so we can use an assumption of constant velocity and determine the average spread of the pattern at some distance from the timing data of the single spheres tracked by the Doppler radar unit. The shots were taken as a baseline at the FBI standard distance of 10 feet between muzzle and gelatin block. This serves to give an idea as to how a shotshell will perform at the room distances common during a home defense scenario. At 10 feet distance it is routine for not all of the buckshot pellets to spread out enough to cut independent paths through the gelatin and this skews the penetration depth figure in the direction of deeper penetration. As such, we recommend #4 buckshot for self-defense only if using plated and heavily-buffered shotshells and the anticipated range of engagement does not exceed 10 yards. 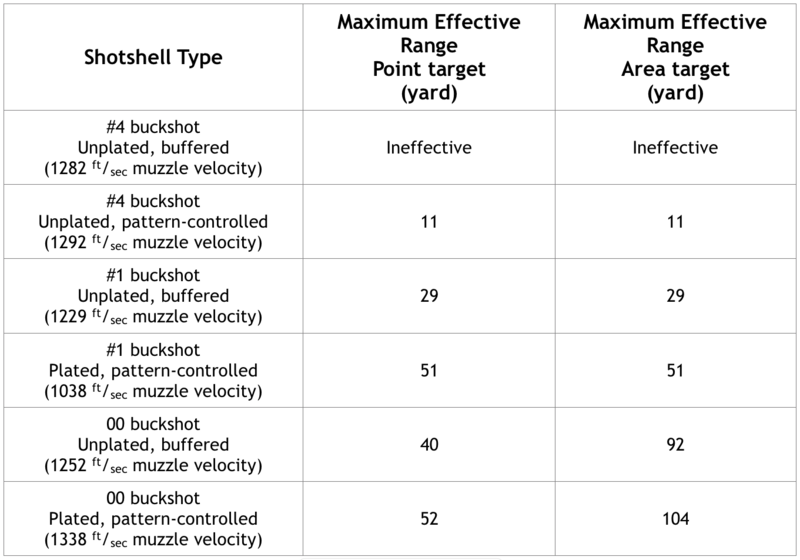 Given that the analysis done for this report focuses on the lethality/hit probability of the individual shot pellet in the shot cloud, it was necessary to determine how suitably the single-launched buckshot represents the terminal performance of each individual shot pellet expelled from a shotshell. The most extensive testing was done with #1 buckshot single-launched buckshot and #1 buckshot shotshells as they are in the middle of the tested group (#4, #1 and 00 buckshot) in terms of sectional density. 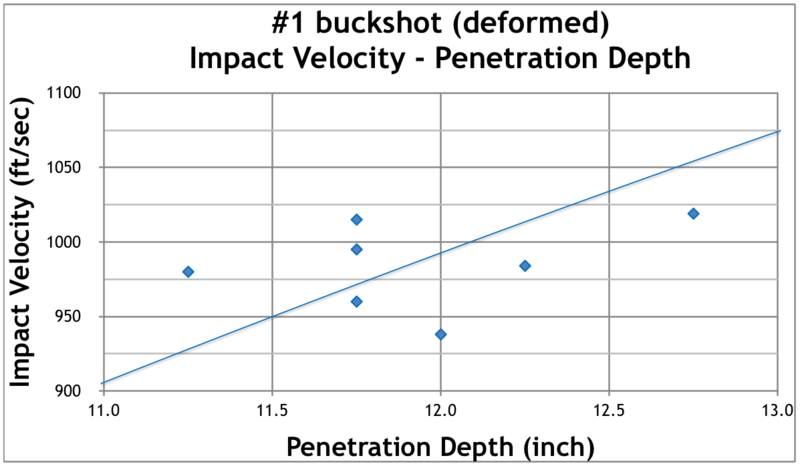 Figure 15 illustrates the velocity versus penetration depths obtained for #1 buckshot single-launched buckshot and #1 buckshot shotshells. 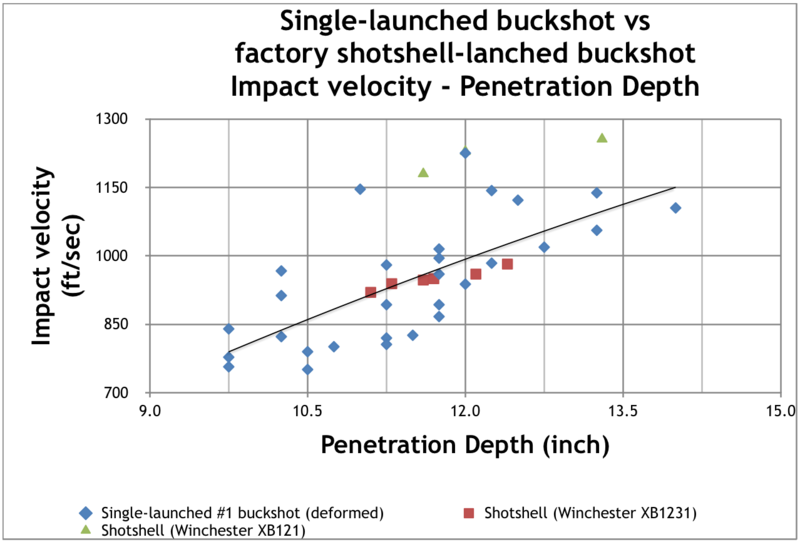 We see a close correlation between the terminal performance of the single-launched buckshot and the factory shotshells. 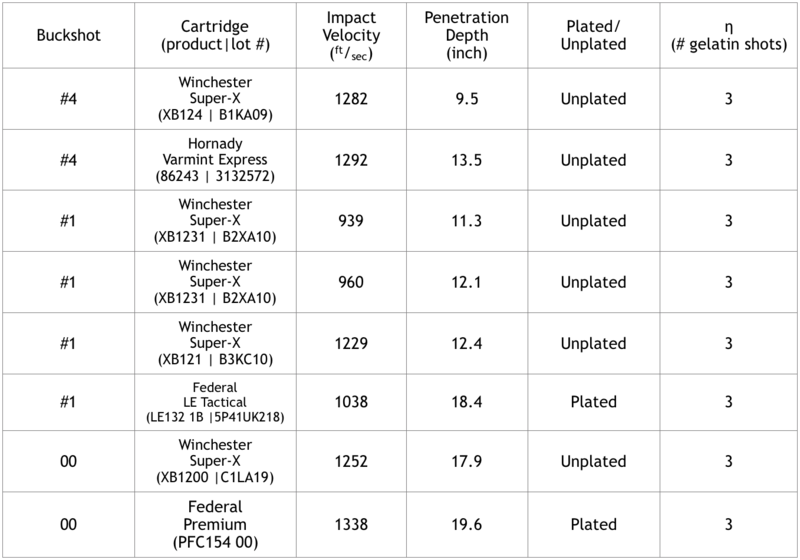 In order to provide a further verification check, a Winchester 1300 12 gauge with 28” barrel (cylinder bore) was shot at 25 yards distance from 10% ballistic gelatin blocks with all shotshell types used in this report. If your duties or circumstances lead you to carry a shotgun for self-defense when outdoors, we encourage you to make use of shotshells utilizing a pattern-controlled shotcup and copper-plated shot pellets. As tested, pattern-controlled #1 buckshot presents an interesting alternative to the more traditional 00 buckshot (also pattern-controlled) in that the maximum effective range is the same but the felt recoil is reduced by 23% over the 00 buckshot load. Since there is no difference in the long range performance of the two shells, we recommend the Federal LE132 1B load to maximize range and minimize recoil for the defensive shotgun. For self-defense indoors or in environments that physically cannot exceed 10 yards distance, we recommend #4 plated buckshot at 1250 ft/sec or higher muzzle velocity. You can maximize your shotguns effectiveness by selecting buckshot that is effective out to your maximum planned engagement distance and no further.